“The biggest thing we need right now is an improved economy, because at least 60% of the revenue problem we’re facing today is a good, old-fashioned economic recession,” says William Dean Singleton. We should be so lucky. But we’re not. The chief executive of the MediaNews Group was on the money when he told PaidContent.Org that an economic revival would be mighty welcome. But even the most robust recovery wouldn’t solve a fundamental industry problem – shrinking classified ad sales – that has been festering for years. If Dean were right and a weak economy were the primary reason for anemic newspaper revenues, then ad sales would be sagging more or less equally across all media, wouldn’t they? But that is hardly the case. In other words, the performance of newspaper-related companies last year was almost 180 degrees at variance with the whole of the media industry. 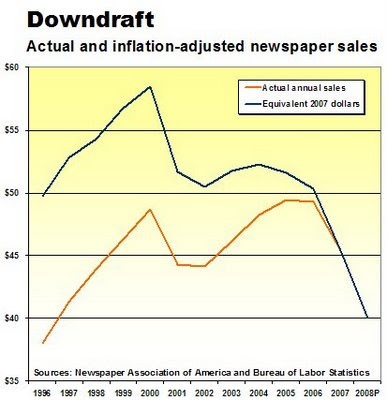 Newspaper ad sales didn’t just go the wrong way in 2007. They have been declining steadily since 2001, when the economy suffered the twin shocks of 9/11 and the tech collapse. Even after the economy rebounded in 2003, newspaper sales consistently trailed the growth of the gross domestic product, as detailed here. 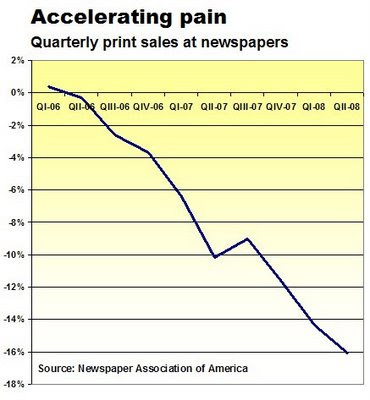 Newspaper sales actually began falling in the second quarter of 2006 – even though the expansion continued for more than a year – and the rate of decline has accelerated ever since (chart here). The chief problem is in the classified advertising business that historically generated 40% of newspaper sales and more than 40% of their profits. Between 2000 and 2007, classified sales fell $5.4 billion, or 27.7% from where they stood at yearend 2000. Recruitment revenues in the period fell $4.9 billion, or 56.3%, to the lowest level in 13 years. Automotive classifieds slid $1.8 billion, or 35%, to the lowest level in 22 years. Real estate sales were the only major category showing consistent gains after 2000, but they plunged sharply in 2007, dropping $1.2 billion, or 22.6%, in a single year. Reasonable men and women may differ as to whether, when and how the realty market will recover now that the federal government has decided to help (or not). Though today’s economy is perhaps the toughest in a generation, the industry’s problem began in the early days of the decade, when classified advertisers began forsaking high-priced print in favor of cheaper, highly targeted interactive media ranging from Craig’s List to Dice to AutoTrader and Zillow. Car dealers, for example, put only 26.7% of their ad dollars into newspaper advertising in 2007, as compared with 52.0% in 1997, according to an annual survey conducted by the National Association of Automobile Dealers. At the same time, the trade association reports, Internet advertising rose from a sum too negligible to report in 1997 to 16.6% of the average dealer ad budget in 2007. While the jury may be out on the future of real estate advertising, there is no doubt that newspapers have lost their grip on at least two of the three key classified categories they used to own. It will take more than a trillion-dollar economic elixir from Uncle Sam to turn this around. As I scrambled from website to website this morning for the latest news while my retirement melted away, the place that consistently had the most complete, convenient and up-to-date information was the Drudge Report. :: A chart tracing the queasy plunge in the Dow Jones industrial average. :: The live CSPAN feed of the House vote on the $700 billion rescue plan, which unfortunately was overwhelmed and periodically unavailable – the feed, that is, not the House. :: The first actual vote results. :: Key financial news like the Wachovia take-over, the Fed effort to pump additional billions into the credit system and a global market wrap-up. 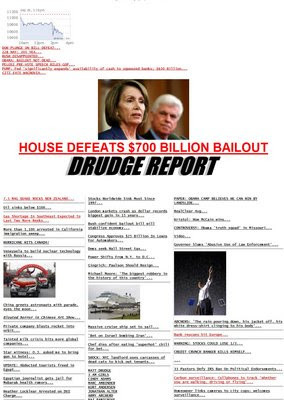 :: The quickest political reaction – replete with a jab at Speaker Nancy Pelosi, because Drudge on even his best day [sigh] is still Drudge. As usual, Drudge provided all this information – plus news of an earthquake in New Zealand, the latest campaign developments and a weird sculpture show in China – in a simple, uncluttered, format characterized by an economy of words and a few visual cues. It is true that Drudge depends enormously on the mainstream media to populate his site. If the MSM suddenly dried up and blew away, Drudge wouldn’t have nearly as much to Report. But with all due respect to the penetrating stories, elegant writing and dazzling multimedia presentations the mainstream media create, they can’t get the hang of delivering breaking news when their readers/viewers – and potential reader/viewers – most crave instant enlightenment. By effectively conceding this opportunity to sites like Drudge, the mainstream media forfeit in significant measure their value and credibility, which, in turn, will constrain future audience growth and revenue prospects. When are they going to learn how to compete? Newspapers have 18 months to prove themselves as valuable cross-media partners for retailers or the flow of advertising dollars away from them may accelerate, publishers were warned this week by their customers. “The next year to 18 months may be ‘make or break’ for the newspapers,” says David T. Clark of Deutsche Bank in a report summing up the NAA Retail Advertising Forum that just wrapped up in Dallas. In the longest sales setback ever, advertising revenues at newspapers declined for 9 of the 10 consecutive quarters in the period ended on June 30, 2008. This surpasses the downturns in 1990-91 and 2001-02, when sales in each case slid for six of eight consecutive quarters before they revived. If sagging newspaper sales don’t turn around in the second half of this year – which few expect they can do – then the decline will be on track to be twice as long as any in history. Based on the industry’s performance in the first half of the year, it appears that publishers will be lucky to break $40 billion in combined print and online sales in 2008. That would be 19% lower than the turnover in 2005, the most recent year of positive sales performance, and the lowest annual volume since 1996. Things could get worse in 2009, because the retail sector – which generates almost half of all newspaper revenues – is suffering from depressed consumer demand and the inability of merchants to borrow the money they need to stock their shelves. Barring an unanticipated consumer shopping frenzy in the fourth quarter, the retail sector may be headed for an unprecedented wave of bankruptcies. With fewer retailers on the scene and constrained profitability crimping the ad budgets of many of the survivors, newspapers will have their work cut out for them. While most of the retailers appearing at the NAA conference continued to profess their appreciation for newspaper advertising, Dave Clark says nearly all of them are moving ever-greater percentages of their advertising budgets to the interactive media – especially when young people are the targets. This presents both a challenge and an opportunity. A successful cross-media program would combine print, online and mobile media to deliver targeted and customized solutions for retailers. With their superior brand strength, unrivaled content-creating capabilities, unmatched print and interactive media and unsurpassed local reach, newspapers are naturals to be the preeminent cross-media sherpas in the markets they serve. Bankruptcy court may be the next stop for some of the most precariously financed newspaper publishers. As awful as the prospect sounds, it actually could be a good thing for the newspapers, because a Chapter 11 bankruptcy filing enables a struggling company to restructure its debt, streamline its business and potentially put itself on a sounder footing for the future. Not all Chapter 11 filings are successful. In some cases they lead to the eventual liquidation of the business through Chapter 7 or some other means. And any bankruptcy action almost certainly would wipe out the equity of such investors as the owners of Philadelphia Media Holdings, the Minneapolis Star Tribune and Sam Zell and his fellow employees at Tribune Co. Fears of imminent bankruptcy already have driven public companies like GateHouse to 33 cents a share and Journal Register Co. to 1 cent, so neither has much further to go. 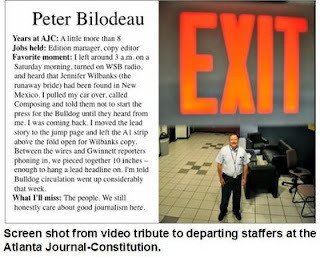 Bad as the loss of their $182 million investment might be for the equity shareholders of Philly Media, Chapter 11 could give management a lot of leverage in rescuing the business from outright collapse. The Philly example discused here generally applies to any financially stressed publisher owing more money than its sales- and profit-challenged business can afford to repay. Under the auspices of a bankruptcy court, Chapter 11 gives a company the right to walk away from unnecessary leases on real estate, equipment and vehicles. It also lets a company renegotiate bills owed to creditors, enabling debts to be settled for cents on the dollar. Wages, benefits and other obligations to employees usually are unaffected by a bankruptcy filing. Bankruptcy protection would give Philly Media’s creditors an incentive to renegotiate the $380 million loan the company’s weak profits no longer can service. Because the company was unable to make its scheduled debt payment over the summer, penalties nearly doubled the interest rate on its loan to 9.5%, according to Standard and Poor’s, the bond-rating service. A renegotiated deal with Philly’s lender, the Royal Bank of Scotland, might trim the interest rate, lengthen the maturity or get the bank to write off a certain portion of the borrowing. Bond traders already have discounted the debt of companies like Philly Media, Tribune, Star Tribune and others to 50 cents on the dollar – or less. So, a reduction in principle may not be as far-fetched as it sounds. Last but not least, Chapter 11 typically gives a company like Philly Media the ability to terminate the restrictive and anachronistic labor contracts that stand in the way of the efficient operation of a company that is literally fighting for its life. Before anyone thinks I am anti-union, remember that my father was a union man, my mother was a union woman and I was a proud member for many years of the Chicago Newspaper Guild. But these are perilous times, and unions, instead of protecting antiquated prerogatives, need to act constructively to preserve as many jobs for their members as possible. While Chapter 11 provides a respite for a troubled company, it is only a respite. At some point, a business either has to emerge from bankruptcy as a going concern or go down the tubes. In the latter event, everyone loses. Seeking the meaning of Gary Pruitt’s sudden resignation from the family trusts that control McClatchy, the Wall Street Journal speculated that the move foreshadows an initiative to issue millions of new shares to pay off the company’s billions in debt. MNI has $2.1 billion in debt. Its shares nowadays are trading at about $3.30 apiece (only 18 cents above today's new 52-week low). To sell enough stock to pay all that debt, the company would have to issue 636.4 million new shares, or 7.7 times more stock than the 82.4 million shares outstanding today. This would result in massive dilution not only for common shareholders like me, but seemingly also for the members of the McClatchy family, who own the super-voting stock that controls the company. Although a common shareholder might have no choice in the matter, this hardly seems like an appealing outcome for the family controlling the company, either. If MNI announced a plan to issue more shares, investors would pummel the stock from its already low price to even lower lows. If the price of the common stock fell by, say, half, then the company would have to issue nearly 1.3 billion new shares, or 15.4 times more than today’s float. This would double the dilution, making the deal even more unappealing to both classes of shareholders. And then there’s the minor matter of who would buy these new shares. Given the awesomely bearish view of the newspaper business among investors, where would MNI find someone to buy $2.1 billion worth of new stock? UPDATE: 9.10.08: In a press release issued at mid-day today, Gary said his departure from the trusts "should not be taken as a precursor to any move by the company or McClatchy family, including taking the company private or altering its capital structure." Now, it’s entirely possible this is going to come down exactly the way the Journal says it will – or that nothing will happen at all. But I still think, as originally reported here, that Gary’s exit from the trust signals either (a) the company is headed down a path to be taken private or (b) Gary is in the process of being ejected as the chief executive, a position he has held since 1996 (sitting simultaneously as one of the four directors of the family trusts for the last five years). The above scenarios, BTW, are not mutually exclusive. Total newspaper advertising revenues fell by $3 billion in the first six months of this year to $18.8 billion, the lowest level in a dozen years, according to data published today by the Newspaper Association of America. The record 14% sales plunge featured the first-ever drop in online sales. Interactive revenues slipped by 2.3% in the second quarter of this year to $776.6 million. For the entire first half, online sales rose a modest $35 million, or 2.3%, to a bit less than $1.6 billion. The $3 billion decline in just six months is equal to 6.6% of the industry's total sales of $45.4 billion in 2007. 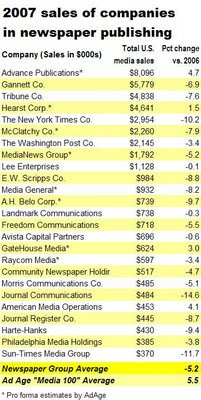 Based on the results in the first half of the year, it appears that total newspaper revenues will be less than $40 billion in 2008, the lowest in a dozen years. As you can see in the chart below, print revenues have declined at an almost continuously accelerating rate for nine straight quarters since the second quarter of 2006. The 16% decline in print sales in the second quarter of this year surpassed the prior record plunge of 14.4% in the first quarter of 2008. The drop in the first quarter of this year was larger than the slide in the last quarter of 2007. And so forth. The sales debacle in the first half of this year was led by a collapse in print classified advertising, which fell nearly $1.8 billion, or 26%, to $5 billion. Help-wanted and real estate advertising each dived by more than a third from the prior year. Recruitment sales fell $710.6 million, or 36%, to less than $1.3 billion in the first half of the year, while real estate tumbled $682.2 million, or 35.5%, to $1.2 billion in the same period. Automotive classifieds dropped $331 million, or 21.9%, to less than $1.2 billion. National print sales slid $416 million, or 13.4%, to $3.1 billion, while print retail revenues dropped $913.7 million, or 10%, to $9.1 billion.